Why do women not wear crash helmets in India ? Because the law permits it, that’s why. I had blogged about this in October last year – if you click on this link, it will take you to my earlier post. There was some follow-up in this morning’s papers, which doesn’t change the status quo at all. 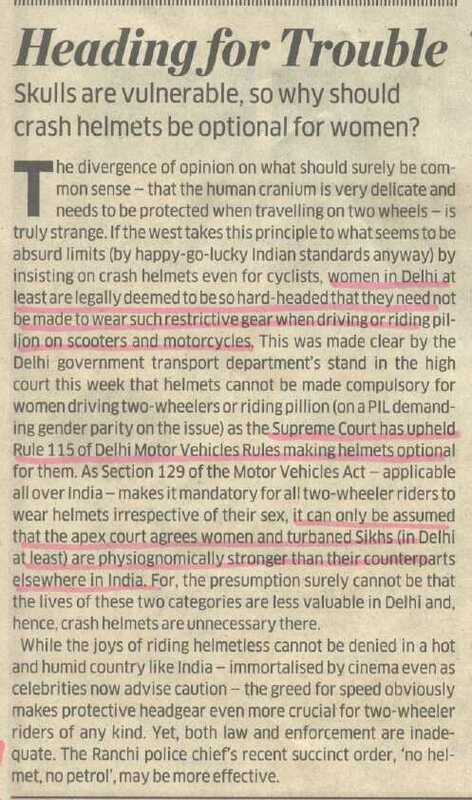 Women and Sikhs are exempted from wearing a helmet. By law. I suppose I can understand the practicality angle for Sikhs – how do you get a helmet on over a turban ? But I think it is lunacy to exempt women. Why? Anyone know the thinking behind exempting them in the first place. Perhaps that story I was told 30 years ago about messed-up hair-do’s was correct, after all. On a lighter note – even if one day Sikhs have to wear crash helmets, here’s one bloke who certainly won’t be able to. 1 comment to Why do women not wear crash helmets in India ? If any turban-toting Sikh thinks that that soft pile will save him in a crash, think again! Oops, did I say think? Sorry wrong word! Am I kidding? There are enough Santa-banta jokes to defend my correction. I have often wondered, is there no one, NO ONE out there, who has thought of a turban covering helmet? In the land that has faced this issue at home and abroad, where forget rubans, kirpans are being forced into being accepted by law (are they blunt kirpans? oh no, the law dare not define that either). Back to my turban suggestion. Go inventors…go make that patent and get a large turban covering helmet design! And ladies, you on the other hand, are morons! Wear the helmet. Actually, you will be serving two purposes. Besides being safe, with the helmet on, the romeos will be left wondering if you are to be approached to hassle! Ha! Two in one solution. Now, you do love a bargain, dont you?